FedEx Express placed a firm order for 50 copies of Cessna's SkyCourier and holds options for another 50, in a deal valued at $550 million at list prices. Textron Aviation took the wraps off a new utility twin aircraft that will become the largest in its growing in-production turboprop lineup. At the same time, the manufacturer announced its first customer, FedEx Express, with an order for up to 100 in hand. A long-time customer of Textron Aviation’s Cessna Caravan, FedEx yesterday formally signed a contract for 50 cargo variants of the new Cessna SkyCourier 408 and options for up to 50 more. Including options, the order carries a potential value of up to $550 million, based on the $5.5 million list price. Plans call for delivery of the aircraft to begin to FedEx in 2020 and continue at a pace of one per month over more than a four-year period for the firm orders. The SkyCouriers will help FedEx replenish its fleet of existing turboprops, including some older Caravans and ATRs. While building on the heritage of the Caravan, the new high-wing SkyCourier is a new design, said Textron Aviation. “The aircraft will fulfill a gap in this market segment with its superior performance and low operating costs in combination with the cabin flexibility, payload capability and efficiency only a clean-sheet design can offer,” said Textron Aviation president and CEO Scott Ernest. The aircraft will be equipped with proven components already in production, such as the -65 variant of Pratt & Whitney Canada’s PT6A turboprop engines and Garmin G1000 avionics, and will be built from traditional aluminum materials. “We tried to keep the airplane remarkably simple so it has the highest possible dispatch reliability construction,” said Brad Thress, senior vice president, engineering for Textron Aviation. Thress said the innovation surrounding the design involves its ability to accommodate heavy cargo demands. Key features include a large, 87-inch cargo door and a flat floor; a nearly 70-inch almost “square” tall and wide cabin that can accommodate up to three LD3 shipping containers; and a maximum payload of 6,000 pounds. In addition, the aircraft will be designed for single-point pressure refueling to speed turnaround time. “FedEx Express has had a great relationship with Textron Aviation over the years, and this new, advanced aircraft will play a key role in our feeder aircraft modernization strategy,” said David Cunningham, president and CEO of FedEx Express. The aircraft, which also can be laid out in a 19-passenger configuration, will be capable of flying up to 900 nm and as fast as 200 ktas. The passenger variant will include crew and passenger doors, along with large cabin windows. “We obviously do a fair amount of activity with the Caravan in the passenger version…There’s always been additional demand for a larger passenger carrier aircraft,” said Ernest, adding the demand is worldwide, but especially in developing nations. But beyond FedEx, Textron Aviation also sees other opportunities in a growing cargo market, as well as for special missions. Plans call for wind tunnel tests to begin in February, with test articles starting “to flow” later in 2018 as the program heads toward first flight in 2019. The non-pressurized, fixed-gear airplane will be certified to Part 23 standards. 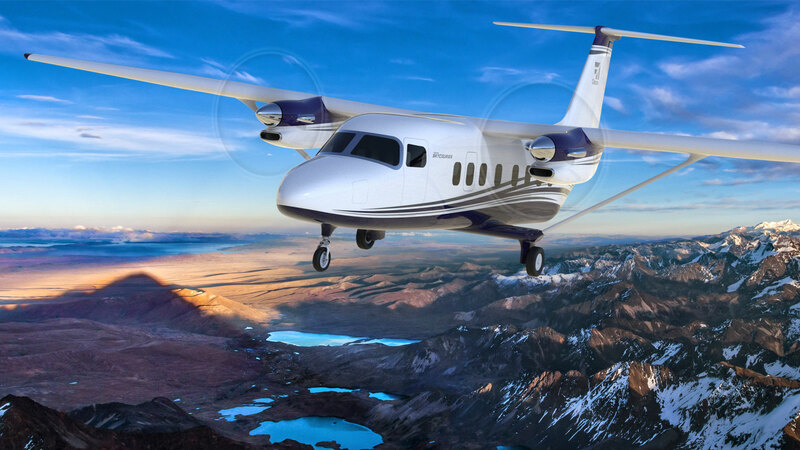 Ernest said the company opted for the venerable PT6A platform—rather than the GE ATP that is powering the company’s all-new Cessna Denali—because of the timing of the program and availability of the engine. View a slideshow of SkyCourier images.